DON’T LOSE YOUR WAY! — a key theme (both as a song and a motto) in the anime KILL LA KILL, produced by Trigger. The story follows 17 year old Ryuko Matoi as she sets out to find her father’s murderer, he/she who holds the missing half of her signature weapon, the Scissor Blade. The bloodlust of Ryuko leads to her enrollment in Honnoji Academy, in which her suspected culprit, Satsuki Kiryuin, is Student Council President and praised like a god by the majority of the population (except Ryuko and her newly found best friend Mako Mankanshoku). Despite no indication of Satsuki even having the missing half of the scissor blade, she provokes Ryuko as her arch nemesis, leading Ryuko to fight her way up a ladder system of transforming battle clothe-equipped followers (called Goku Uniforms). Ryuko must even take down Satsuki’s most loyal followers, the Elite Four, who are equipped with superior three star Goku Uniforms. Ryuko then unintentionally discovers her father’s secret weapon: a sailor outfit designed specifically for her. By the chance, one of Ryuko’s wounds spills blood onto the outfit, to which it awakens and puts itself on her. Together they discover that by using Ryuko’s blood, the uniform can transform into a battle mode called “Life Fiber Synchronize.” Ryuko names her new partner Senketsu (after the activation of blood), and as a team they attempt to fight their way up the chain of command to kill her father’s murderer. This is the plot in a nutshell, sparing the viewer spoilers for the sake of preserving the first hand viewership. In accordance with this month’s theme of female protagonists: Ryuko Matoi is a diverse and unique character in the anime world. She’s not your average female anime protagonist who exits her home in episode one with toast in her mouth because she’s late (there are many animes that start this way). No, Ryuko is a stubborn, aggressive, and overall badass teenager. The fierceness of her objectives provide a sense of immortality, and a disregard for fear of death. Some would argue that Ryuko is one of the top-rated female characters in anime. Some would even suggest that ideal solely based on her personality and uniqueness. Despite gradually becoming stronger through collection of “life fibers” from her defeated, Goku Uniform-wearing opponents, Ryuko’s apparent weakness is her inability to remain calm. In this section there will be small spoilers, but with the intention of detailing Ryuko’s character. Considering her reasons and circumstances for revenge, it would seem natural for Ryuko to lose control of her emotions. As such, when Ryuko becomes too emotional her blood boils, and causes her to lose control of Senketsu. When control is lost, Senketsu takes over (by no intention of its own) and turns into a monstrosity of an abomination. On the other hand, when keeping calm and in rhythm, Ryuko and Senketsu enter a perfect state of life fiber synchronize and their unified power becomes far superior. For these outcomes, it is apparent that Ryuko’s personality is a key factor in determining performance. This is not to say that Ryuko’s anger is necessarily not ideal, considering that aggression and determination are positive attributes to Ryuko’s success, but the loss of stability from extreme anger can essentially break all hope in the situation at hand. Another major part of Ryuko’s personality is how she adapts and changes along the course of the show. When Senketsu and Ryuko enter life fiber synchronize mode, Senketsu transforms into a skimpy battlesuit, as it transfers much of its material to armour the shoulders, which exposes much of Ryuko’s skin. Now the first time they enter this mode, Ryuko is extremely embarrassed as the outfit becomes quite revealing. The embarrassment of course hinders Ryuko’s abilities in the beginning. However, she learns to embrace the embarrassment as it boosts her power and continually increases it after each win, making Senketsu her ultimate weapon. Returning to the subject of Ryuko’s rage and how it negatively affects her connection with Senketsu, there is one instance in particular where Ryuko loses control of Senketsu. Senketsu turns itself and Ryuko into an abomination of sorts, until her rage has subdued by the power of friendship… and the senseless slap fest she receives by the hands of Mako. Why is this significant? The reason for why Ryuko becomes so angered to the point of losing control of her emotions and Senketsu goes back to her ultimate goal. Ryuko comes face to face with the murderer of her father, the owner of the twin to Ryuko’s scissor blade, Nui Harime. She interrupts the battle between Ryuko and one of the elite four with scissor blade in hand, and cheerfully informs Ryuko that she killed Isshin Matoi (her father). Ryuko’s bloodlust sweeps her to the point of no return, where her emotions become an abyss of anger, hatred, and a need for revenge that swallows up Ryuko and Senketsu. Ryuko manages to escape death after this event and resents Senketsu for quite awhile, but learns from her mistakes and is able to become stronger from it. To conclude, Ryuko Matoi is one of the most unique female individuals in the anime world simply because she does not follow the norm provided by female protagonists, however; her character is much more than that. It can be argued that Ryuko is one of the most passionate/determined female characters when it comes to achieving their ultimate goal. She is not just an angry teenager, but a badass who also has a soft side. Although her ultimate goal is in the form of vengeance, Ryuko experiences friendship, love, hate, anger, sadness, sorrow, and a whole lot of other feelings and ideals that are displayed in the short twenty four episode show. 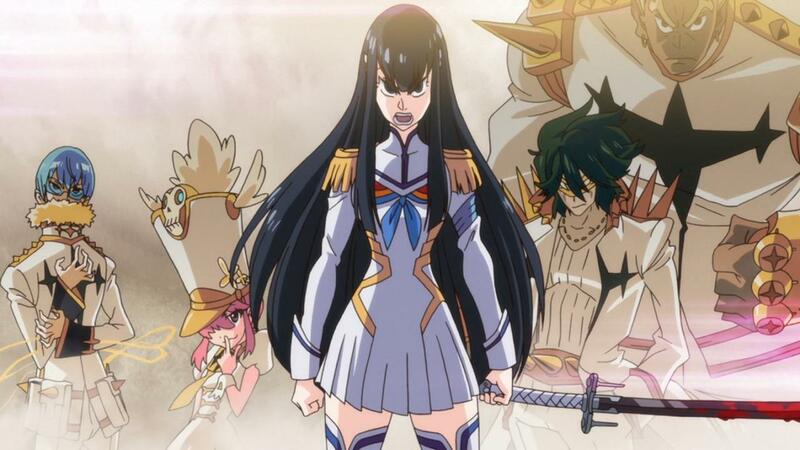 For a review of the show as a whole and a much more in-depth analysis of the show, a suggested article to check out would be AlexHex’s KILL LA KILL Review. The aforementioned article was a great source of inspiration and is quite informative. If you do not watch KILL LA KILL for Ryuko as a character, watch it simply because it is a very obscure action anime that is wellwritten, unpredictable, and hilarious in many random instances.